Justen Leslie has invested $10,000 in a vehicle he only uses once a year, on Father's Day. Leslie competes in the Grand Island Father's Day Lawn Mower Race under the supermodified category, and he has participated almost every year. “We’ve planned on going to other races, but this is the one that we built it for,” Leslie said. Leslie and his team at Leslie's Collision & Restoration have salvaged used vehicle parts for the modified mower. It took them a summer to complete, but they’re always seeking to tack on more. Right now the mower can hit about 75 mph in 300 feet. 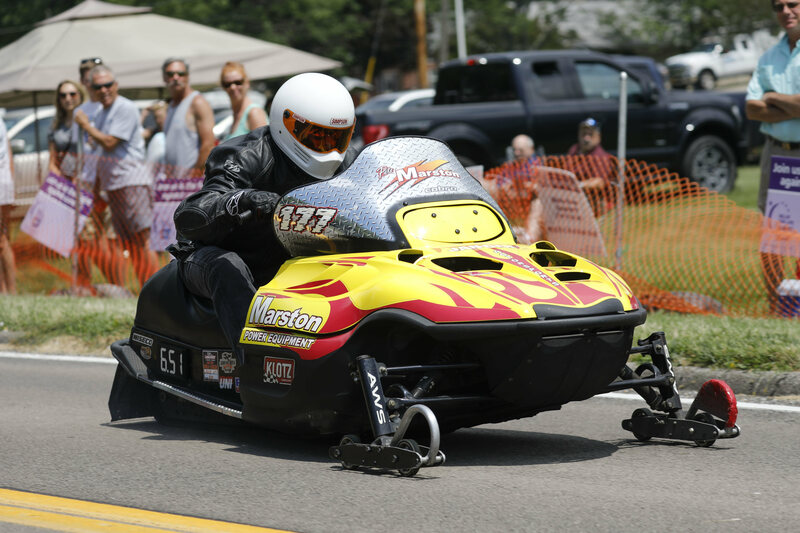 Leslie said he doesn’t know how popular lawn mower racing is anywhere else, but on Grand Island, it’s a tradition. About 300 people came out this year, despite thunderstorm warnings. The event is sponsored by Relay for Life of Grand Island to raise money to support the fight against cancer. The race, held on Sunday, started in 1978 as a friendly enough rivalry. 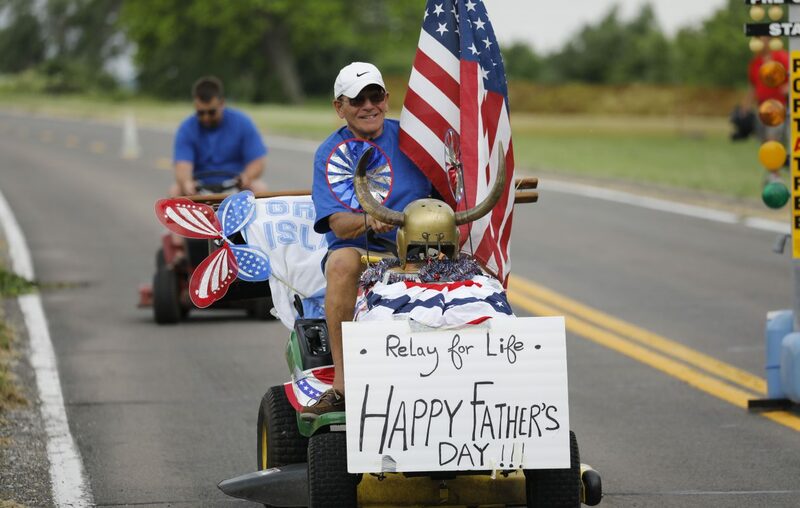 On Father’s Day that year, Floyd Doring told his neighbor Pat Murphy that he could beat him racing his lawn mower down the street and back. Doring won. A rematch was called for the next year and other dads got involved, growing the crowd from two families to 10. It became a neighborhood tradition that focused on giving back. The race has donated to a children’s hospital, local firefighters and most recently Relay for Life. This year, organizers expect to raise about $8,000, bringing their Relay for Life donation total to at least $40,000. The race’s camaraderie continues today. Behind the starting line, racers and their spectator friends joke around, some encourage, others poke fun. “Don’t be so serious,” one says. “Cool down,” another teased. The lawn mowers have their own divisions. 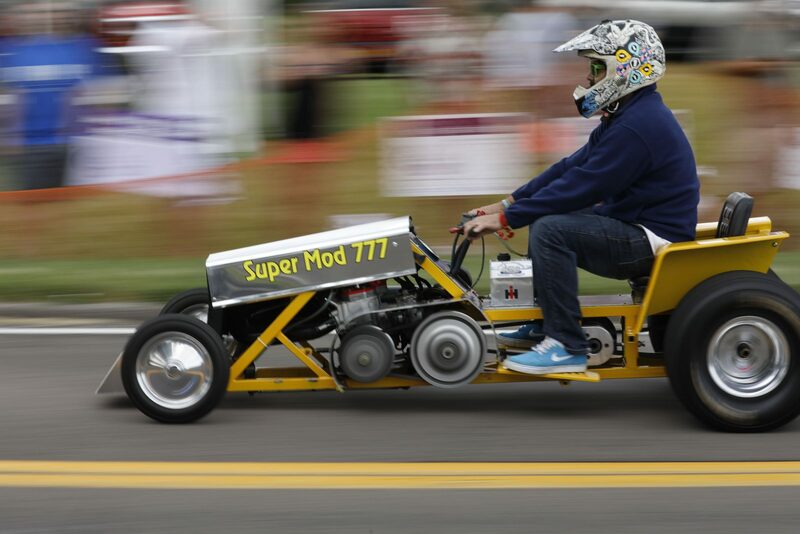 Modified and supermodified are distinguished by their speed. Stock are the mowers as they come from the store, with no modifications. They can have decorations – most included American flags. And this year, for the first time in the event’s history, a snowmobile was entered. “This thing is like a bullet,” said Pete Marston, owner of the snowmobile. Because it had no competition, Marston raced for fun against a few supermodified mowers. Some participants race for fun, other play to win. Body language is a tell. A few put their hands in the air like a roller coaster; they’re just there for the ride. Others are strategic. In the modified and supermodified divisions, a few riders leaned their bodies forward and down, resembling a bullet flying through the air. One driver, Dan Wasiewicz, said he appreciates the excitement and the fear that comes with racing on a mower. He enjoys knowing that his son is in the stands shouting words of encouragement. While fathers played with their “toys,” the kids had lawn mower races of their own with plastic push mowers set up in a play area. Prior to the lawn mower race was a 5k walk/run at 10 a.m. in honor of Doring's son, Kevin, who died from cancer in 2013. The event also includes a classic car show and two local bands provided music. Fluse, an award-winning funk and blues band composed of local high schoolers, played the first half and The Yasgur Project took over for the rest of the event. This was the first year that food trucks participated. “It’s a great community event," Marston said. "It’s a great cause, and it’s a great way to celebrate Father’s Day."